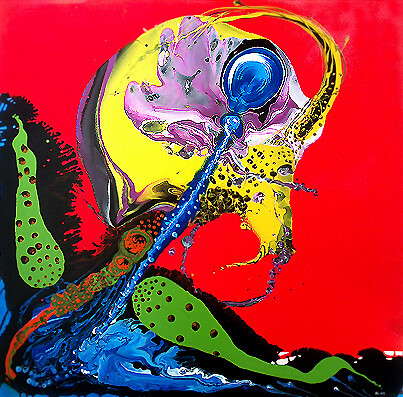 According to the critic Michael Fried, painting’s “primordial convention” is “first to attract the beholder, then arrest and finally to enthrall the beholder, that is, a painting has to call to someone, bring him to a halt in front of itself, and hold him there as if spellbound and unable to move”. This certainly describes my experience of Peter Ray’s paintings. In my view, he is the most exciting painter to come along in many years. He has a preternatural ability to think and feel in pictorial terms. His vision is fresh, and his instincts are modernist. He has said “when I become too concrete or figurative, the painting stops for me.” But he has also said that he wants his paintings “to tell a story”. Taken together, these two quotes give us Ray’s aesthetic in a nutshell. Ray’s signature is improvisational paint pouring, taking the approach of Jackson Pollock and Morris Louis to a whole new level. Amazingly, the result is hyper illusionistic and surrealistic, often invoking Salvatore Dali. He gives to modernist painting a new emphasis on drawing, and intense complexity of detail, as well as enormous fluidity. But Ray can paint any which way, from broad arm’s length brush strokes à la deKooning, to the use of a fine brush to achieve old fashioned modeling. He is a true virtuoso. But it is his many ways of pouring that makes his work so distinctive. In his 2009 New York exhibition held at the Bridge Gallery last December, Ray utterly surprised me. He had incorporated Pop Art, specifically Jeff Koons, and, more generally, the “combines” of Robert Raushenberg. Peter easily consumed them both. Starting out in his native Bulgaria, Ray was first a boxer, then an actor and then a film maker. Because of his country’s economic and political instability, he immigrated in 1991 to Montreal, Canada. There he wrote a volume of poetry in Bulgarian called “Nails of the Cross” and a novel, “The Thinker”, also in Bulgarian, which appeared in 1997. The latter gained him national recognition and was translated into French. Another Bulgarian novel, “The Conqueror”, appeared in 2000. In the same year, inspired by an epiphany he had after an ice storm in a park in Montreal, Ray turned to painting. 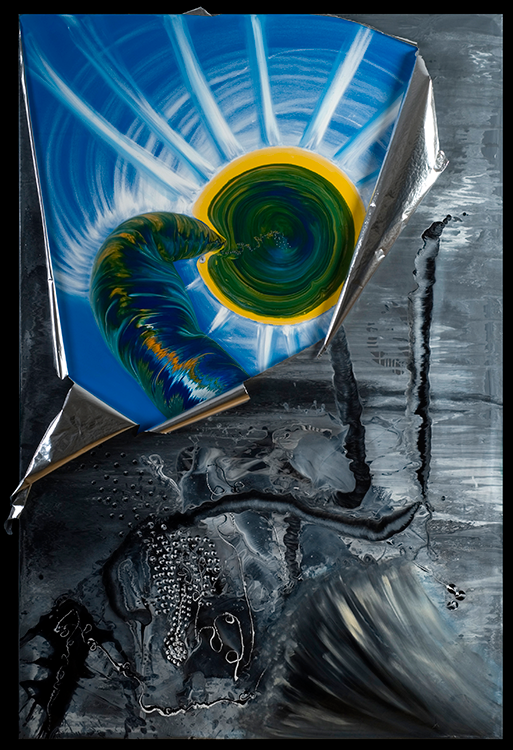 Ray’s art is rooted in European surrealist painting especially biomorphism and automatism. But he has also embraced Post World War II, North American abstraction, above all the work of Jackson Pollock. 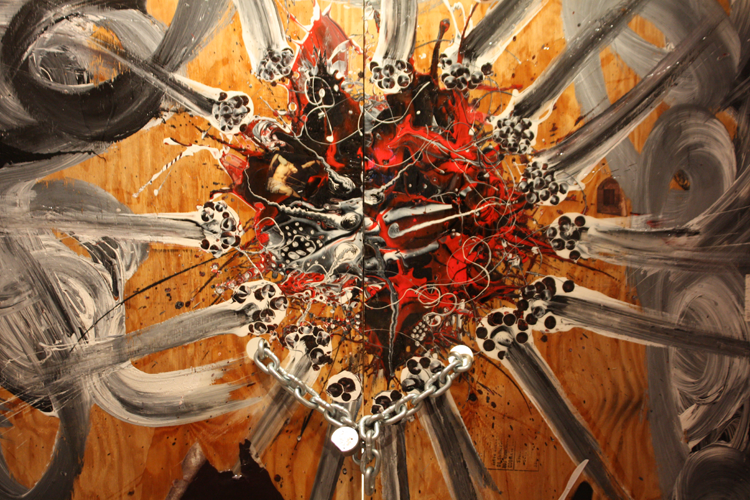 Like Pollock, Ray creates a dynamic field of forms arrived at by ideation and improvisation. 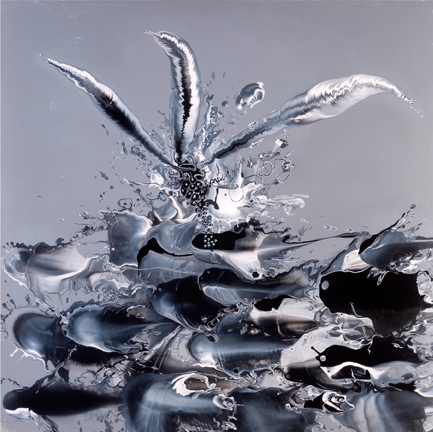 Like Pollock, Ray loves black and white and the visual properties of aluminum. 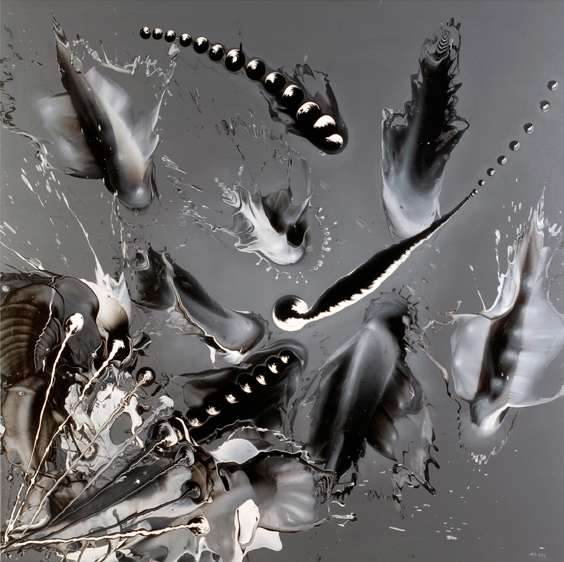 But the handling of paint in Ray’s pictures differ radically from Pollock and Pollock-like painting. 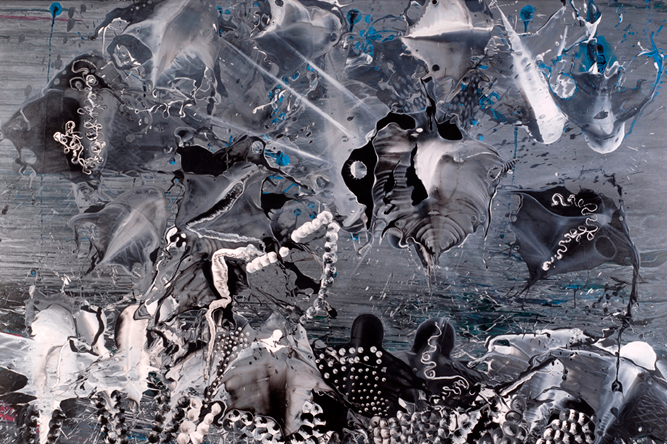 Next to Pollock, Ray is far more illusionistic and vivid. Pollock and his followers opened the picture out, spreading it across the wall. The result is simpler, more decorative unities than Ray’s, which are more easel scale, and address us more personally; rather than back us up, they draw us in. There is modeling, dramatic foreshortening, sometimes deep space and theatrical lighting, but no consistent perspective or light source. It’s all free form. Ray usually gives us a dramatic, and fantastic, biological event. There are forms that suggest jellyfish, tendrils, bubbles, cords, buds and much else. The visceral and the sexual is everywhere evoked as is the subatomic, aquatic and cosmic. In the end though, it is Ray’s uniquely visionary vision which grips us. Ray’s content can have a disturbing even menacing quality. He sometimes includes collaged images of intense suffering and martyrdom. His work is far less sublimated than is Abstract Expressionism, or Color Field painting, or the “New New” painting. But, in the end, Ray’s art, like theirs, is a celebration of human creativity and genius. He had done wonderful paintings before, but, in my mind, Ray first stepped forward as a major figure at his 2006 exhibition staged at the Nordelec Building in Montreal. Here he limited himself to black and white, which enabled him to feature his absolute mastery of dramatic chiaroscuro. Many of these grisaille pictures have a beautiful silvery tone. They are at once intensely graphic and brilliantly painted, exquisitely refined and expressively forceful. Ray is a “sculpture-draughtsman” type master (like Ingres, Degas, Picasso and Pollock) rather than a “pure colorist” (like Delacroix Monet, Matisse and Morris Louis). But he can be daring with color, and he knows very well how to make it count. In 2007, Ray produced a startling new series. In these he wrapped a finished, fully dry painting on canvas, with aluminum paper, with the aluminum side facing the painting, and the brown, blank paper side facing outward. Then he painted on the paper. Finally he tore away some of the paper revealing the canvas behind and leaving rolls of aluminum as a kind of inner frame. It is a picture within a picture, a kind of multi dimensional, trompe l’oeille. These he showed the same year at the A & D Gallery in Philadelphia. With a former actor’s flare for the dramatic, Ray tore away the aluminum paper on each picture at different times during the opening. 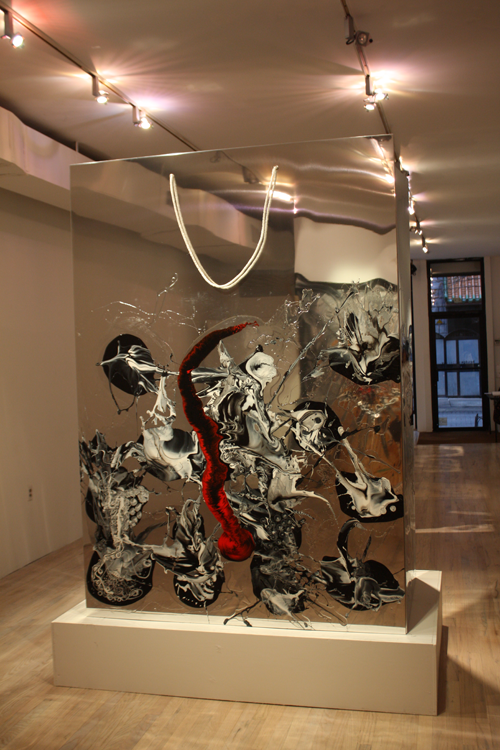 In his first show at the Bridge Gallery in New York, in 2008, Ray put on display his ever expanding range. I remember particularly the masterpiece, “Nothing to Fear” (50″x100″) in which he added earth colors and warmth to the inherent coolness of grisaille. He framed it like an easel painting with a carved wooden frame. Altogether, the show had less focus than the Nordelec show but was more expansive and varied. 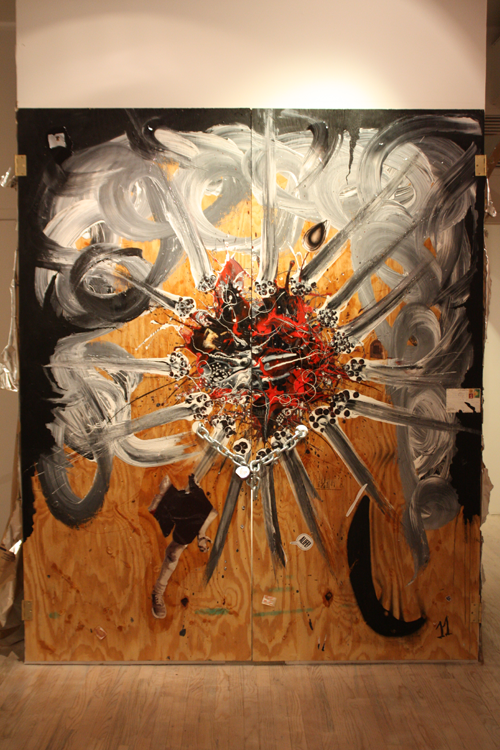 The two largest pieces in Ray’s 2009 show at the Bridge Gallery were “Milena” and “Doors”. “Milena” is a 95” tall aluminum shopping bag sitting on a 1′ base. Its four sides are 83″ wide on the long sides and 59″ on the short sides. At the top are eyelet holes with a draw string identifying it as a shopping bag, an icon of consumerism. Meanwhile, running around the “bag” at eye level is a band of beautiful, free form painting in black and white with a few areas of red. Each of the four sides of “Milena” is a picture in itself but also part of a continuity; one is impelled to walk around it to see it all. It reminds me of Pollock’s frieze-like paintings but without beginning or end. The aluminum mirrors more but is also blunter that the shinier aluminum paper he had been using. And the epoxy varnish, which he has using so effectively since 2007, is especially striking next to the aluminum. As always, Ray here works his magic, alchemist-like, from the incompatibility of oil and acrylic paint. “Milena” can be seen as a parody of Koons, showing how it’s really done. How to make a passionate, personal statement out of the cute idea of a glitzy, high end, shopping bag. The celebration of consumer society is here marginalized by the celebration of the artist’s self. He playfully and lovingly named the piece “Milena”, after his wife. “Door” is a more complex work. It is made up of two, closed, naked wooden doors each with metal hinges and a hole for the knobs. Snaking out of these holes is a real, shiny, heavy, metal chain with a heavy duty lock. It is lit from behind so that real light shines through the crack between the doors and from the holes. Ray’s cool, grisaille painting is here set against the warmth of the raw wood grain. There is a pulsating central matrix just above the chain and lock. Throughout there is an accenting with bits of collage. The theme of unveiling, of something behind being revealed, was already there in Ray’s torn aluminum paper paintings. And again, the stupefying level of the paint handing redeems everything, however potentially over literal or stagy. If “Milena” gives us modernism and post modernism side by side, in “Door”, they are woven together into a seamless whole. Each in their own way, both works are aggressively physical. But the wood grain and the aluminum also count pictorially as warm and cool respectively. So too, their unique visual properties are perfect, yet unexpected, foils for two of Ray’s most spontaneous displays of free form, abstract painting. And two such different conceptions! One might well ask why such a brilliant modernist painter would bother with the banalities of Pop? Ray sees it differently. He suffers no constraints and has always wanted his painting to go back to where it began. In 1999, when he saw the devastation caused by the ice storm, his impulse was to give the shattered roots and branches a “second life” through paint. But they proved difficult to paint, so he began seeking out old, discarded, wooden furniture. A few months later, in 2000, he started working on canvas. His recent return to the world of objects is a return to his beginnings, but with a twist. By embracing conceptualism and objecthood, he prompts himself to make each work more unique, more newly conceived. 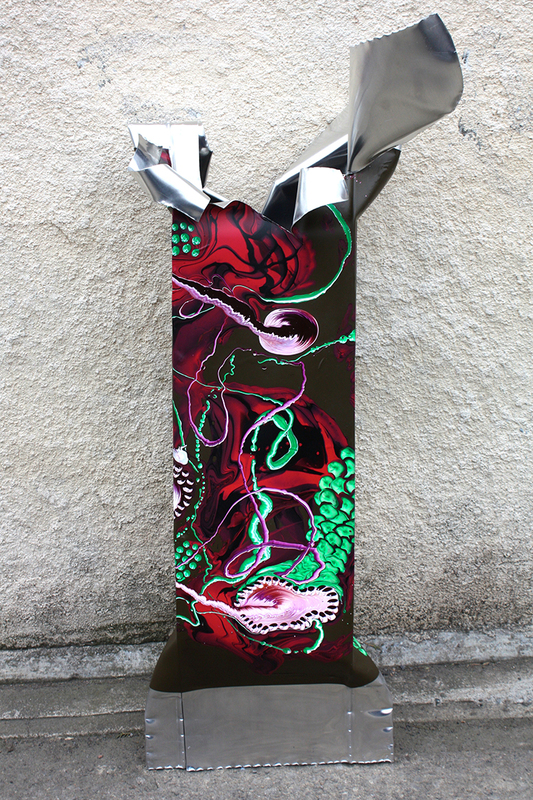 Most recently Peter has worked with a manufacturer in Montreal to make three foot high, aluminum, soda cans and candy wrappers, which he then crumples, tears and paints on in his inimitable way. 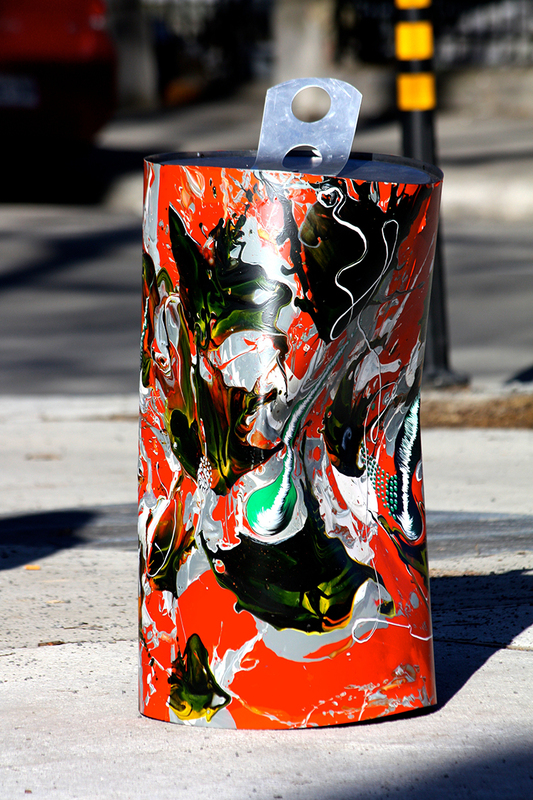 In the case of the can, this idea has prompted his boldest use of color yet. Ray has it all: passion, intelligence, originality, and amazing powers of eidetic visualization. Technically dazzling, indeed, mesmerizing, Ray’s paintings show a profound and capacious mind, seeking singular, spontaneous perfections. His pictures unite the extreme opposites of precision and freedom, abstraction and realism, perverse sensualities and hard hitting machismo. It is doubtless this hunger to unite extremes, which give Ray’s art its sense of largeness.